Wishing you & yours the loveliest of lovely Thanksgiving Days! This year I am thankful for my amazing husband and all he does to support & take care of our family, my fun-loving, nut ball of a son who always keeps us on our toes and fills our home with laughter, and our brand new, sweet little baby girl. I am thankful for all of the fun & exciting opportunities that lay ahead for my growing business, and for the opportunity for my husband & I to follow our dreams . . . and of course, I am thankful for all of YOU!! 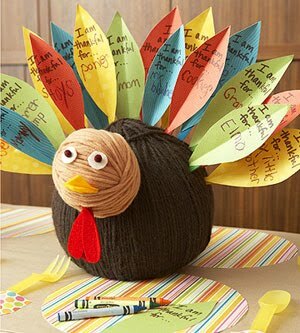 ~ Ask each child to write what she’s thankful for on a paper feather, then stick it into this cute turkey centerpiece. ~ Cut a 1-inch sliver off the bottom of a 9-inch polystyrene ball. Wrap sphere neatly in thick dark-brown yarn, covering surface completely; knot on bottom. Make a 4-inch ball from light-brown yarn and attach to body with a wooden craft stick. Create simple facial features using felt: white circles (approximately the size of a quarter, with 1/8-inch pom-poms for pupils) for eyes, yellow triangles for the beak, and long red felt teardrops as the wattle. Cut feather shapes from colored craft paper and bend in half lengthwise to create seam. Glue wooden craft stick to the bottom third of the feather and insert in a fan shape on turkey body.